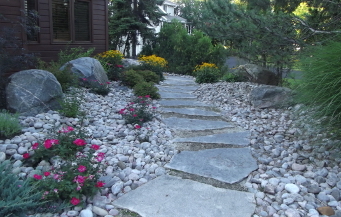 We provide the natural stone products you need in Toronto, and because we produce our stone products, you can have your landscaping materials delivered quickly and efficiently. Rocked face on 3 sides, flamed or natural top. Sizes Range from 3’ up to 8’ long. 7” Rise, 18” deep. Natural Face, Flamed Top & Cut Bottom. Rise 6” to 7”. Sizes range from 2’ up to 12’ long. 18” to 20” depths. Rocked face. Size 7” high x 6” deep x 16” long. Step ends will give your stairway a finished look while adding support. Rock edge on 1 long side, flamed or sandblasted top. Sizes range from 6 sq.ft. up to 12 sq.ft. pieces mixed on a skid. Sizes range from 8sq.ft. up to 12 sq.ft. pieces mixed on a skid. Thickness 2” Flamed Top, 3 Natural Edges and 1 Sawn Edge. Small bulk armour stone delivered in a dump trailer. Orillia Limestone with lines on the face. Sizes range from 4” to 12” high. Large bulk pieces available or smaller skidded material available. Grey Limestone with moss, holes, and lines. Small 50 lb stones up to 2000 lb boulders. Sold crated, bulk or dump trailer loads. Orillia Limestone with distinct lines & natural wavy top. Sizes ranges from 15” to 28” high with various lengths and depths. Orillia Limestone with a natural wavy look. Sizes vary on a skid. Sizes available vary from pea stone up to 8” bulk. Call ahead for stock and availability. Crated is available by special order minimum 4 crate purchase. At Maxwell Stone, we offer natural stone products to residents of Toronto, Newmarket, Aurora, Vaughn, Innisfil, Barrie, Collingwood, The Blue Mountains, Thornbury, Muskoka, Orillia, Southern Georgian Bay, Grey County, Meaford, Owen Sound, Orangeville, Thornhill, Scarborough, Woodbridge, Mississauga, Brampton, Caledon, Mono, and Bramalea, Ontario.